Superdry women's SD Stealth ski down bomber jacket. 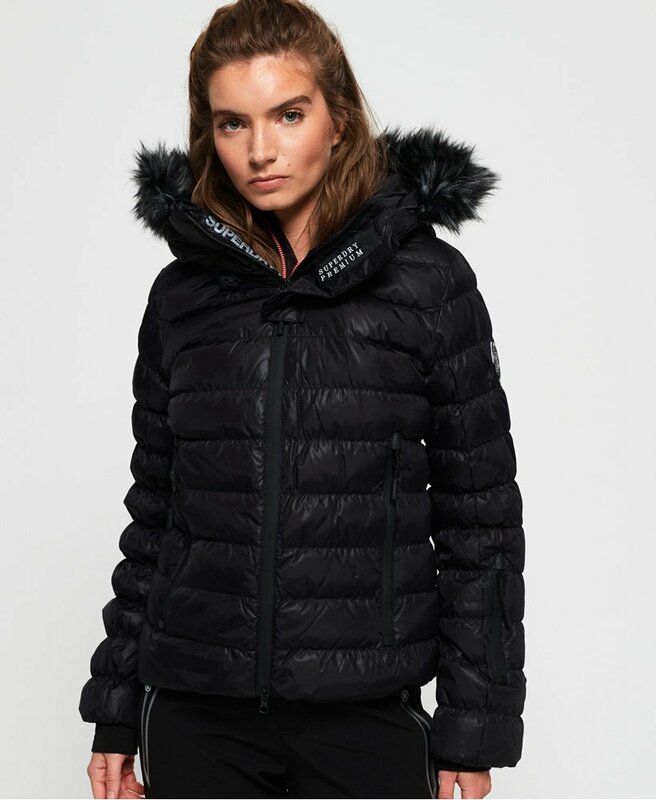 This premium bomber is the perfect year round ski jacket, designed with reflective Superdry adjustable popper braces. This bomber has a 90/10 premium duck down filling and a very high down fill power rating, providing fantastic insulation. This jacket has a foldaway hood with detachable faux fur trim, bungee cord adjusters and a reflective Superdry logo. This bomber also features a zip fastening and a reflective placket, which can be held in place with the magnetic popper. This jacket also has a snow skirt, elasticated cuffs, two external coated zip pockets and a ski pass holder. On the inside is a pocket and discrete pit zip venting. To finish, this jacket has Superdry branding throughout, including the zip pulls, reflective features and a snow badge on the sleeve.